It’s a cold Monday down here on the Texas Coast, but time for another Rockport fishing report. Mid November is upon us and it’s already a holiday week for many. So we want to keep everyone up to date on the fishing conditions around here. And hopefully, we can let you know what to expect for the remainder of your holiday weekend to come. We’ve had a pretty good week since our last report. We did have a few down days to start out the week. Lot’s of rain, clouds, wind and very cold temps were the program for Monday and Tuesday. So those were excellent days to stay inside, tie flies, or do pretty much anything other than head out to the water. Daytime highs were in the upper 40’s and overnight lows were in the upper 30’s. Throw a stout North wind on top of that, and there was no chance we were getting out on the water those days. Wednesday was the beginning of the change in our week. Morning temps were in the upper 30’s still, but calm winds and sun were taking over our forecast. A late start was needed on this day, so we opted to drive South and fish Baffin Bay for the day. 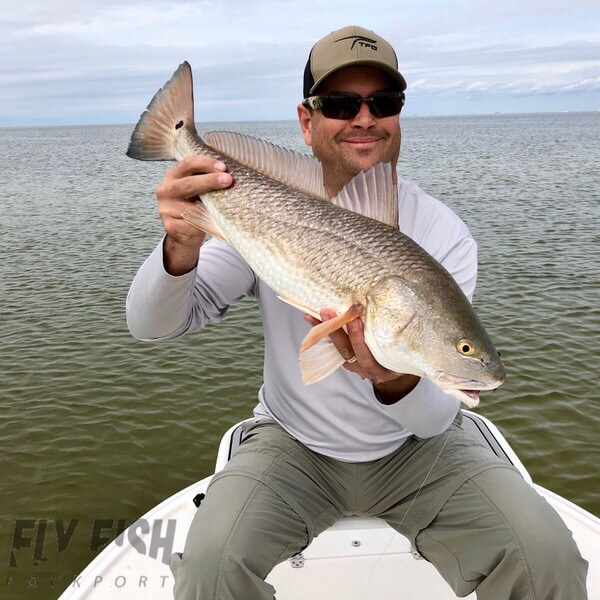 We have lost a little bit of water through this last cold front, so the lower water levels made some of our favorite spots in Baffin Bay ideal for the micro skiff. Even a fish finder can show to you where the movement is and help you on your way towards making that next big catch. We were on the water a little after 10am that morning and began seeing fish right out of the gates. The reds were up extremely shallow cruising slowly for food. Most were showing their backs while moving around, making them very easy to find on the calm day. By the time we were pulling the boat at 3pm, there were better than 2 dozen fish to the boat. Not bad, for a short day. Thursday, Friday and Saturday were much more of the same. Mostly clear skies, little to know wind and a nice little warming trend each day. This topped out in the mid 70’s Saturday afternoon. The fish responded as you would expect. Each day fished extremely well. Tailers, cruisers, crashers and schools were all easily spotted throughout the days. The fish were feeding really well throughout the bays around the area. We had boats from San Antonio to Corpus Christi Bays, and everywhere in between. All had very good fishing. Sunday brought us another change in the weather. Rain, increasing North winds and decreasing daytime temps brought in our next cold front. Today is no better. Our high temps are hovering right around 50 degrees today, with plenty of moisture in the air. Again, not so ideal for getting out on the Texas flats. So we have been hiding out again, in hopes of warmer weather soon. Now, back to the fishing… Fly selection wasn’t much of an issue the days we were able to get out, for the most part. The topwater bite was tough on the colder days, as to be expected. But it did pick up as the water temps warmed throughout the days. But beyond that, the fish weren’t too selective. One day started with a crab pattern. Dark colors are still our favorite. A client tied on his own pink and white Clouser the next morning. This fly lasted all day long, boating who knows how many fish. Another rod had a darker colored toad, which worked well. Again, pretty much everything tried, caught fish. So not too tough there. With the colder morning temps, the fish were moving pretty slowly at times. Often to the point where it was hard to tell if that cruising fish had picked up your fly or not. During the colder hours, many didn’t lunge at all for a fly. Often, they wouldn’t turn left or right for the fly as well. But as soon as it was stripped directly under their nose, they would slurp it up with ease. As things warmed up, you would notice the fish going out of their way much more often to attack the fly. But some of those morning fish were a little trickier in that regard. So getting it really close to them was the key, even if it took a handful of casts. Most didn’t seem to mind much. As we continue our holiday week here, its looking like the weather is trying to improve. It’s looking like we will have a few little rain showers here and there. Most lingering around with this North wind. But as the week goes on, it is looking better and better all the way through the weekend. So we are looking forward to getting back out there tomorrow and the coming days, as things begin to warm up. Hopefully, the fish will react similarly to this past week, and come out of the storm with a vengeance. Or course we just have to wait and see there. We are on the water every day this coming week, including Thanksgiving morning. So we will keep things up to date on the site and such for the folks looking to take advantage of their long weekend and get out on the water. You can always contact us any time if you would like to BOOK A TRIP or need any up to the minute Southwest Texas fly fishing or Rockport fishing type news. We continue to post on Instagram, Facebook, Twitter and Snapchat. Or perhaps SUBSCRIBE to our YouTube Channel as well. We continually are trying to add more videos and stuff there. We try to keep stuff fresh for those of you that are wishing you were on the flats with us. So be sure to follow us on all our social media stuff. And don’t forget to sign up for our monthly newsletter below. Join the Fly Fish Rockport newsletter to get future Fishing Reports right in your inbox.